Stu's great-grandfather, John D. Wilson, is the most-recent documented arrival in North America among his ancestors. He departed Glasgow in 1864 around his 12th birthday. James Duckworth, Janet's third great-grandfather, arrived in New York from Lancashire, via Liverpool, in 1827 at age 21. We extended our stay in Britain at the end of our Road Scholar program to explore these family origins. We liked our comfortable, well-located Edinburgh hotel, and continued to stay there as we researched at the National Records of Scotland. This is the most complete source of civil and other records of Scotland. After a full day we found no pots of gold, but located a couple of clues that warrant some follow-up–and might lead somewhere. The other reason to stay in Edinburgh? To meet-up with our friends, Rosemary and Frank who live in North Berwick, about 25 miles outside of the city. 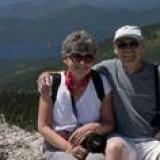 Rosemary is a professional, consulting genealogist and has helped Stu with his Scottish research. We enjoyed an excellent lunch and engrossing conversation with them at Hadrian's Bistrot, just across the street from the National Records Office. The following day we took the short train ride to Glasgow, where we checked-in to the Albion Hotel in the Kelvinbridge District, just off the Great Western Road in Glasgow's West End. Small, cozy and pleasant, it's well located a few steps from the Underground station. The Albion is a 20-minute walk from the Mitchell Library–home of Glasgow Archives and Glasgow Family History Center. We searched the archives looking through logs of vessels entering and leaving the port in 1864, hoping to find the ship that brought John D. Wilson to North America that year. After several hours of delicately turning pages in fragile old volumes, we came up empty. Frustratingly, the period from June to the end of the year was missing! We did figure out that we also needed to view log books for the ports of Greenock and Port Glasgow. Unfortunately, they were not at the Mitchell but in a different archive. Helpful staff at the Mitchell produced a copy of Stu's great, great grandmother's burial record. She was interred at Glasgow's Eastern Necropolis in 1859. This was the document needed to locate her burial site. Next morning we took the Underground, then a taxi to the cemetery. We met a fellow named Robert who drove us to Section 6, where Stu's great-great grandmother, and John D. Wilson's mother, Mary McCauslin was buried in an unmarked grave. We had attempted, unsuccessfully, to locate Mary's grave on a trip here in 2012, but additional inquiries in advance of this journey ultimately paid off. She had died in childbirth and been buried in a pauper's grave in "common ground." We felt fortunate to find it and left flowers on the grave. That evening we enjoyed a memorable meal at Stravaigin on Gibson Street, a walk of less than a half-mile from our hotel. 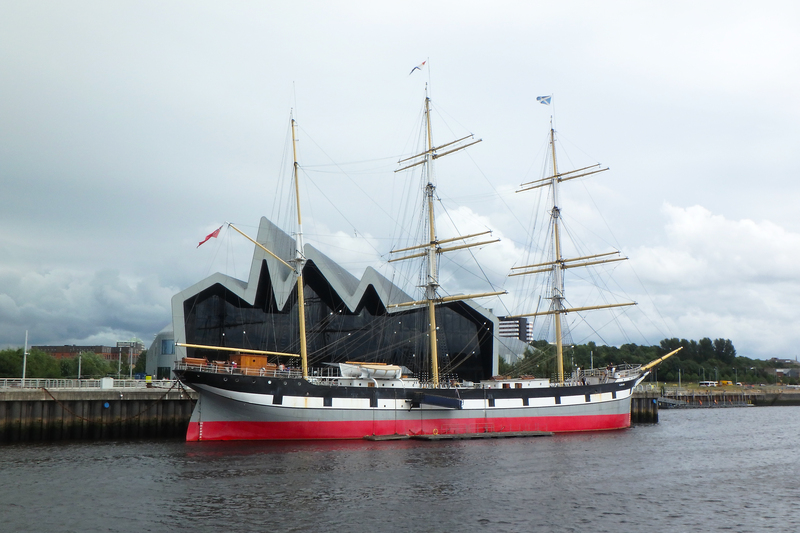 Our final day in Glasgow we visited the Riverside Museum, a striking building on the banks of the River Clyde, exhibiting everything to do with transport in Glasgow over the last couple of centuries. The three thousand objects on display include cars, locomotives, a subway car, bicycles, skateboards, and a sailing vessel. The Glenlee, launched 30 years after Stu's great-granddad sailed, is one of four sailing vessels built on the banks of the Clyde still afloat. One of the others is the Balclutha at San Francisco's Maritime Museum. Boarding at Glasgow Central Station next morning, we de-trained at Preston about 2 ½ hours later. We rented a car for the couple of days we would be in Lancashire. This allowed us to drive directly to the village with the wonderfully English name of Oswaldtwistle. We were greeted warmly and immediately offered tea in the cozy kitchen of the "Lancashire Family History and Heraldry Society." We received research help from a couple of members in the all volunteer organization, but alas, we made no breakthroughs. We knew we were in the right place, though–it seems that the nearby city of Blackburn and environs may be the only place on the planet where Duckworth is a common surname. We confirmed this by driving up Duckworth Hill, and enjoying lunch at Duckworth Hall Inn, both just outside of Oswaldtwistle. We learned from a framed newspaper clipping hanging on the wall of the pub that the name Duckworth was attached to this place as early as the 13th century. Later we visited Blackburn Cathedral where James Duckworth married Mary Ann Holden in 1827, just before they sailed for New York. The former village of Little Harwood (now a neighborhood of Blackburn) where Janet believes James was born, and the Blackburn Old Cemetery, where James' parents are likely buried, yielded no compelling clues. But the Old Cemetery clearly deserved its moniker and offered a sense of history. Having exhausted our family history leads, we visited the small charming town of Clitheroe, and enjoyed dinner at Ribchester Arms in its namesake village, a beautiful historic place with ruins of Roman baths. Next day we returned the car in Preston, and hopped the train to Euston Station in London. From there we taxied to Paddington Station where we caught the Heathrow express train and then the airport shuttle to our hotel for a night's rest before our morning flight to San Francisco. Though with less success in finding ancestors than we'd hoped, we reaffirmed our view that just being in the place where they lived brings us closer to them.